Home Will Phil Win His First WPT Title? Will Phil Win His First WPT Title? Not to say Ivey isn‚Äôt the Tiger Woods of Poker, but if Woods was among the final six players on the final day of six different golf matches, he surely would have walked away with at least one title. Just saying. Yes, Phil Ivey has won just about everything you can win in poker. So with six remaining, will this be the time that Phil Ivey adds a WPT title to his five WSOP bracelets and countless international and cash game earnings? 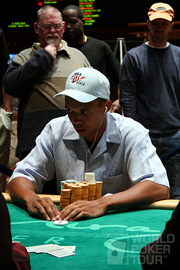 Ivey has the chip lead going into the final table, stacked at 1,395,000. Close behind him is Cory Carroll, the man with incredible name-alliteration, with 1,235,000. Darrell "Gigabet" "Deep" Dicken proves that stamina goes a long way, as he’ll bring 1,203,000 to final table play. The rest of the final table consists of: Jonathan Little – 956,000, Richard Kirsch – 810,000, Burt from Sesame Street – 571,000. Cards fly at 5pm EST. Read final table blogging here. * Image from World Poker Tour. Oh, and a Main Event Bracelet, maybe. Will Jeffrey Pollack’s Federated Poker League Work? All In The Musical Song Title Are a Joke, Right? Seriously Though, Right?